Update: Senate Bill 1014 received a due pass recommendation on Feb. 5 during it’s third reading in the Senate, and the bill with Sen. Paul Boyer’s floor amendment was transmitted to the House. 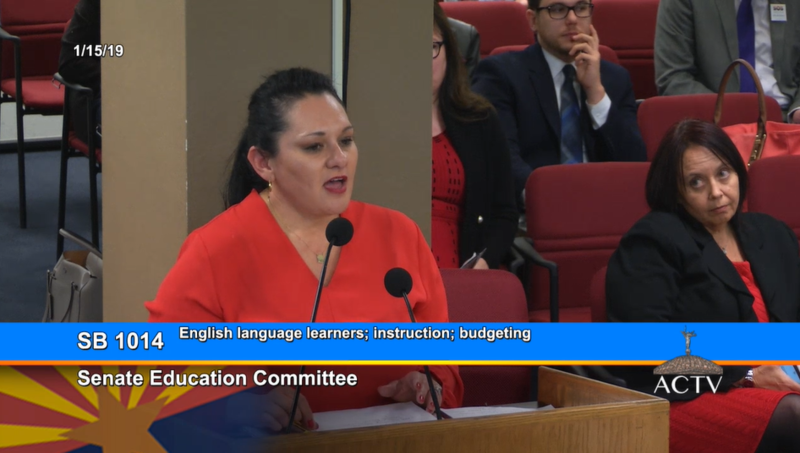 Education advocates spoke today in support of Senate Bill 1014, which provides schools flexibility in instruction for English Language Learners, and the Senate Education Committee approved the bill with amendments. 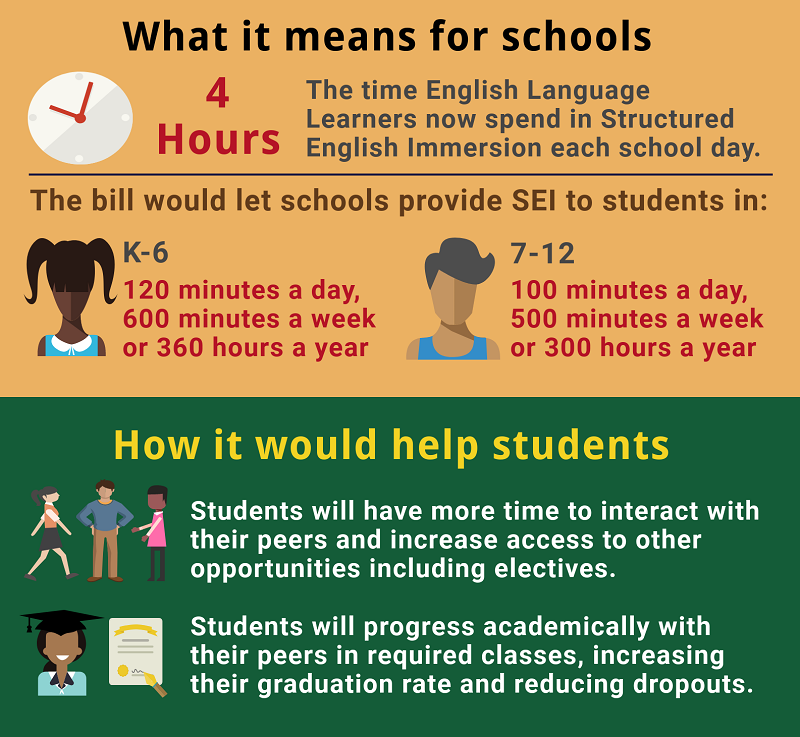 SB 1014 would provide schools more flexibility in how they deliver instruction to English Language Learner (ELL) students and that would help more ELL students graduate high school on time. The ELL student graduation rate in Arizona is currently about 20 percent – the lowest for these students in the entire nation. Currently, English Language Learners spend four hours each school day in Structured English Immersion instruction. Senate Bill 1014 would let schools instead provide evidence- and research-based models of structured English immersion for 120 minutes a day, 600 minutes a week or 360 hours per yer to students in grades K-6 and 100 minutes a day, 500 minutes a week or 300 hours a year to students in grades 7-12. That portion of the bill is similar to last session’s House Bill 2435, which was not scheduled for a vote on the Senate floor despite support from Republicans and Democrats. There is a lot of new research regarding English Language Learners “and to be honest with you, what we’re doing in Arizona is not researched-based and it actually shows that it is going backwards,” said Marisol Garcia, who has taught social studies for 15 years and is also a Structured English Immersion instructor in the Isaac School District and vice president of the Arizona Education Association. “My school district is one of those that veers from the norm, we have 23 percent of students in our SEI program, so you can imagine the handcuffs that our small school district is forced to deal with when it comes to staffing, when it comes to everything, when you have to comply within these very prescriptive things,” Garcia said. SB 1014 would also require the State Board of Education to adopt and approve evidence- and research-based models of structured English immersion for school districts and charter schools to use with English Language Learners that would take into consideration the school’s size, location, grade-levels and percentage of students who are English Language Learners and require annual assessment of students. The bill would also allow school districts to submit evidence and research-based models to the State Board of Education for approval. “We know this bill will allow our education professionals to really do what they were hired to do – to work with parents, to work with research, to do the best thing for each one of the individual kids,” Garcia said. 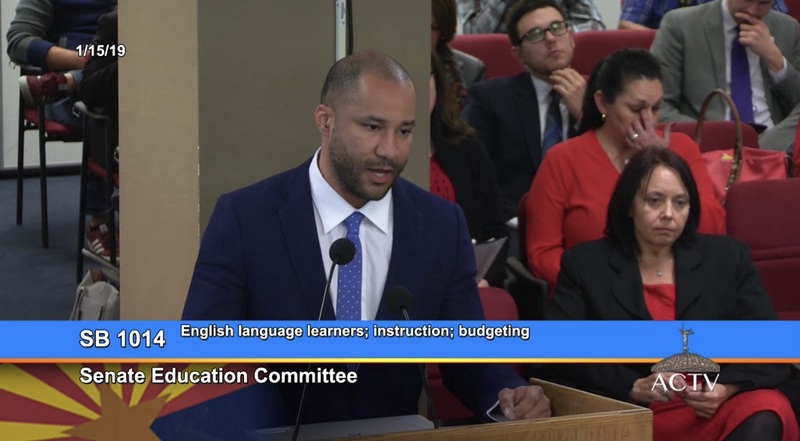 Garcia said the current SEI model segregates English Language Learners from their fellow students, that there is a shortage of qualified SEI educators, causes scheduling issues and limits teacher’s tailoring instruction to their individual student’s needs. Lawrence Robinson, president of the Roosevelt School District Governing Board and president of the Arizona School Boards Association Board of Directors, told Senate Education Committee members that the SEI model is failing students. If this bill passes, local education agencies can work together with parents and research to do what’s best for these kids so that all these kids can continue to grow, Garcia said. In September 2017, Tucson Unified presented a research-based model to the State Board of Education. “We believe that a strong English Language acquisition and development program is essential to students success; however, Arizona’s current law has limited us to a model that is based on very little research. Other language models with strong research do exist,” Manzano said. Without fluent English speaking students in the classroom, ELL students do not have student role models and that is also a problem, Manzano said. “The current model limits the time students spend learning content. They’re limited to learning English Language Development and this creates a gap not only in language development, the acquisition of English, but also again in content knowledge, which directly affects the graduation rate of our English Language Learners,” Manzano said. Paula Cortes, secondary language specialist with Tucson Unified School District, spoke in favor of SB 1014. 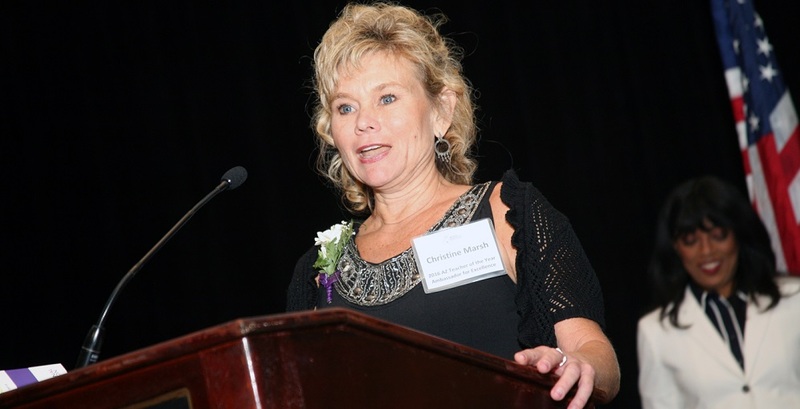 When English Language Learners have increased interactions with English dominant students, they learn language faster through peer-to-peer modeling, Cortes said. The Senate Education Committee approve SB 1014 with 8 ayes, 0 nays and 0 members not voting. 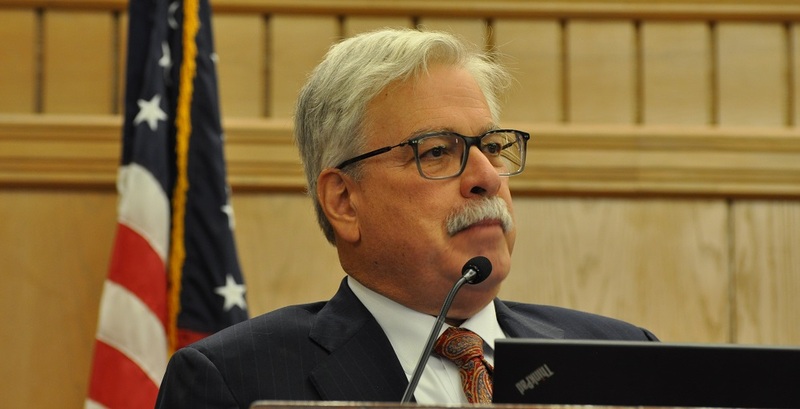 A few years ago, a bipartisan group of educators went up to Utah to look at their English Language Learner program, which is basically software driven, Gray said. 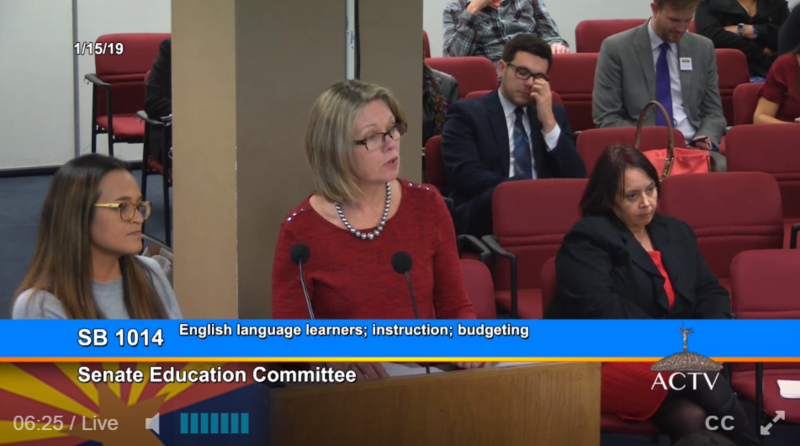 It’s appalling that Arizona’s English Language Learner program costs millions of dollars per year, but is not showing positive results, Gray said. “I fully support this bill, but I also believe there are better ways – we live in a digital society, kids are visual learners, they’ve got software programs now that will teach a child and in essence, have a mentor in the program take them up where they need to be individually,” Gray said. “I see no rationale to stick with a program that is only reclassifying 11 percent of our kids right now, even if you believe that’s the law and we should stick to it. The law’s broke and it doesn’t work,” Quezada said.